Just checked and I already have that value set. Thanks for posting the solution. I'm guessing someone else will need it at some point. Is there an instruction manual? I've searched and this 96 page thread is the closest thing I've found. What is Output Archive? Why does it have a browse feature? Why doesn't it go to the Output Path? Why can't I dot it? What is the purpose of "Second archive?" Why multiple paths? With answers to those questions, I could probably figure out why I'm getting an error: "Output path currently contains 11Mb which could be deleted. Do you wish to continue?" This is for Line 1724, Column 2, which as far as my limited knowledge of scripting goes, refers to deleting files and folders. I'm running MM 4.1.23.1881, and running the 'Backup' addon (v6.0). I have two issues that I'm running into. All I really want to do is back up my music and settings, so if someone has another recommendation, I'm open to suggestions, since it's entirely possible that I'm doing this the hard way. 1. 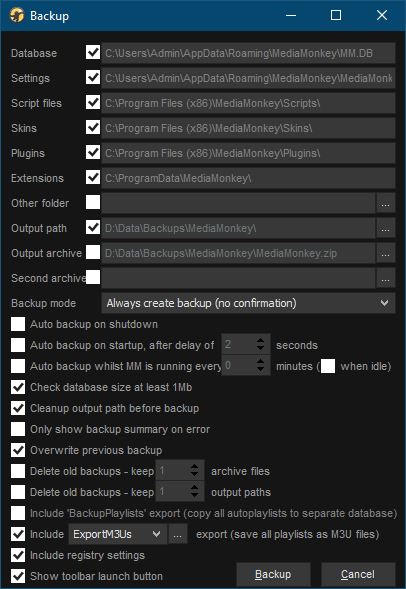 When trying to configure the 'Backup Archive' (Which I take to be the music itself, but I could be wrong), I can set the floder, but I can't click on the radio button to turn the option on. 2. When shutting down MM (Which is when I have the backups scheduled to happen), "Backup canceled because output folder already exists", which seems kind of silly, since most people want to back things up more than once in their lifetimes. Anyway, I haven't figured out what I'm doing wrong, and any help would be greatly appreciated. OK, so in other words, this addon has no support, at least looking at this thread and the age of the addon... I guess I'll just do the backups thru Windows, no big deal. I still use the Backup Addon, but I never set it to backup at shutdown, as I always used to get errors. I don't use Auto either. 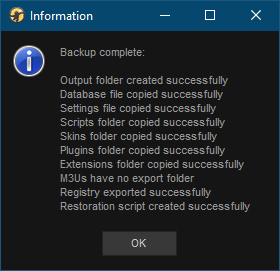 I just click on the Backup icon from time to time, and I never have a problem.